I sometimes get asked how many hours per week I spend on work from home projects. While I can give a general guess the truth is, I’m not exactly sure. So I decided to track it. Tracking my time left me with a very surprising result…..
My morning routine entails waking up, getting myself and two daughters ready for the day, driving the girls to school and then coming back home and working. My “already-done list” was blowing my traditional to-do list out of the water. I felt such a sense of accomplishment when I could look back at the end of the day and see so many things I had done. And it didn’t stop with work either. I started writing down everything I did while the girls were at school. Laundry? Check. Make lunch? Check. Feed the animals? Check. Watch Dr. Phil reruns? Nope……I stopped “sneaking” in TV time because I didn’t want to write it down. I’m sure I stopped sneaking in a lot of time wasters I normally succumb to. Keeping an already-done list versus a to-do list turned out to be monumental for my productivity. A couple general guidelines for making this work. First, tracking every minute of time doesn’t really work when kids are home. You can still write down what you’ve done but it’s harder to track it down to the minute. If you’re working at home by yourself or are at a workplace I’d highly encourage to track how long it takes you to do certain tasks. This can be a huge eye-opener. Secondly, it’s good to have a general list of things you’d like to get done for the entire week so you can go from one task to another without having to think about it. Every Monday write down every single thing that MUST be done and add throughout the week as necessary. Then, every day when you begin working start tracking what you do and how long it takes you. Once you have one thing done look at the next thing on your list. It’s so insanely simple but I cannot even begin to tell you how much more I’ve accomplished since I began doing this. It’s crazy. 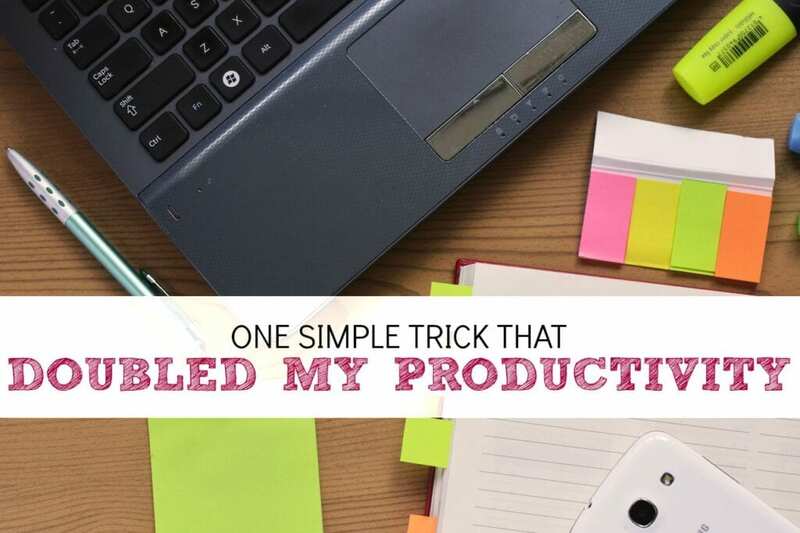 Try it out and let me know how much your productivity increases! I came here ready to hate on the click baity title, “One simple trick! lol. But damn this is actually a brilliant idea. Sometimes it takes me days to write a post because I get so distracted. (Twitter gah!) I can see this system really working for me. Thanks!!!!! Sorry for the clickbait title 🙂 But it really is so insanely simple and produced tremendous results! This is fantastic. I’m moving from one steady work at home job to seeking out several free lance jobs, so this is exactly what I needed. Thanks!!! You’re welcome! I hope it works as well for you as it has been for me. Brilliant to track your time. I am a huge fan of batching my work into 2 or 3 hour blocks and noticed all the free time I have to do other things. I love batching too. It’s much easier to stay in the groove of things when done in batches. I love real life posts! I have a hard time getting to work after the kids get to school. It’ s easier for me to wake up and start writing when no one else is here. Yes, me too. Trying to write when the girls are home is painful so this system mostly just works when they aren’t around. Thanks for the tip, as I’ll have to give it a shot. I’m very bad about procrastinating on certain tasks or losing focus. I’m hoping this method will get me going in the right direction. Same here. I seem to lose focus pretty easily but I love being able to write down what I’ve done and see it all laid out. Hopefully this can help you too! I always seem to get what has to be done completed no matter what. Doing it this way though has helped me get the things I *want* done in addition to the things that have to be done. What a great simple trick. 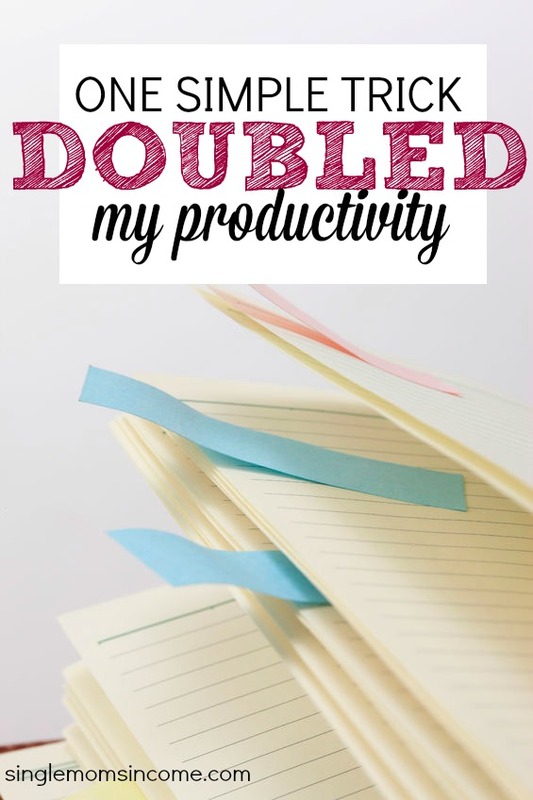 As a freelance writer and mom to twins you know I’m always trying to find ways to maximize my productivity! I use Trello to note big projects and pen and paper for my to-do list, but I like your idea of putting it all on one paper at the beginning of the week. I never thought about tracking my time on each task. That’s a good idea because I know I do a lot of time wasters (like email can take me a long time or just “checking” my Pinterest can take me me 20 min). After Easter I’m going to start tracking my time and seeing if this helps with my productivity! I think it will help you as a writer. For me it was eye opening seeing how long it was taking me to come up with post ideas. I had no idea that it took me as long to come up with a good idea as it did to write for some of them. Try it and see how it works for you!